The CyberGrasp haptic feedback interface represents a revolution in human-computer-interface technology by enabling CyberGlove® users to actually "touch" computer-generated objects and experience realistic force feedback via the most natural interface possible - the human hand. The CyberGrasp is a lightweight, unencumbering force-reflecting exoskeleton that fits over a CyberGlove and adds resistive force feedback to each finger. With the CyberGrasp force feedback system, users are able to explore the physical properties of computer-generated 3D objects they manipulate in a simulated 'virtual world'. The grasp forces are exerted via a network of tendons that are routed to the fingertips via an exoskeleton, and can be programmed to prevent the user's fingers from penetrating or crushing a virtual object. The tendon sheaths are specifically designed for low compressibility and low friction. The actuators are high-quality DC motors located in a small enclosure on the desktop. There are five actuators, one for each finger. 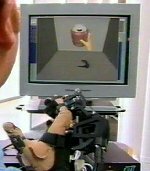 Originally developed under STTR contract to the United States Navy for use in tele-robotic applications, the CyberGrasp system allows an operator to control a remotely-located robotic "hand" and literally "feel" the object being manipulated. The CyberGrasp system offers enormous benefits for "real world" applications, including medical applications, virtual reality training and simulation, computer-aided design (CAD), and the remote handling of hazardous materials. This 21 minute video demo highlights the products, technology and applications of the CyberGlove instrumented glove, the CyberTouch option that adds vibrotactile feedback and the CyberGrasp force feedback option. The video demo leads the viewer through setup, use and customer applications of our instrumented glove systems. Choose 56K or ISDN download. A 22-sensor CyberGlove is required to use CyberGrasp. Existing 18-sensor gloves can be retrofitted by Virtual Technologies.